I’ve had this Tiffany&co ring for several years, and it is one of my most beloved rings. My worst nightmare came true when one of the links of my 18ct golden ring broke off. You would think, that with an expensive ring like this one, you would at least get top-notch customer service. Sadly, this was not the case. First of all, this is not the only Tiffany&co item I have. I have 3 rings, a necklace and a bracelet. All of these expensive silver and golden items broke. All of them. Literally, all of them. So, I went to Tiffany&co in Melbourne to show them my broken rings, and hoped they could help me out. 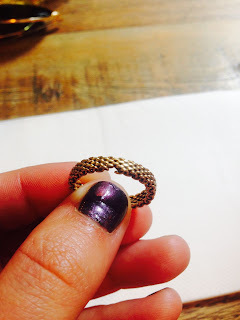 Two of my rings snapped, and my golden ring (pictured in link) is missing a few links. The pretty girl at the desk immediately told me that it was my own fault. She didn’t say how sorry she was for the inconvenience, or tried to look for a solution, she just told me it was my own fault. She told me the rings were too big (they were fitted by Tiffany&co staff in Amsterdam) and thus while carrying grocery bags and such, they bent and snapped. An expensive silver ring snapped, under the pressure of a grocery bag. Even my H&M ring could withstand the pressure. She then sent me up to customer service, where I was told they couldn’t do much for me. One ring could be repaired because it was under a year old, the other one I had to pay for, and the golden was not even an option. He literally said it was too labour extensive to try and repair it. Do you have a similar experience with Tiffany and Co? Make sure you share it, write a review on their Facebook and spread the word! Auteur: Unknown op 9/23/2015 05:29:00 p.m.